MORTAL HEART Makes Another Best of 2014 List! Robin LaFevers' MORTAL HEART has made another best of list! School Library Journal includes the third book in the His Fair Assassin trilogy as a Best Young Adult Book of 2014. Congratulations, Robin! Deborah Underwood's CAT Makes the Best of List! The votes are in and Kirkus agrees Cat is one of the best! 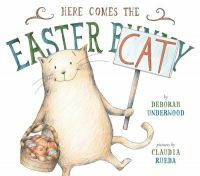 That's right, Deborah Underwood's HERE COMES THE EASTER CAT was voted as one of the 2014 Best Picture Books for Animal Lovers by Kirkus Reviews. Congratulations to all those who made the list, but most especially to our own lovely Deborah and the irrepressible Cat. What an honor! KA Holt Knocks Another Book BEYOND THE RAILS! One thing you should know about Kari Anne Holt: She is a novel writing machine. No, really! Her most recent book, RHYME SCHEMER, came out from Chronicle in October to rave reviews, and she has two more books still forthcoming. For those of us who have gotten to know and love her rich characters, quirky wit, and moving storylines, there's even more good news ahead. This week, Kari has sold yet another book, again to the luminous Tamra Tuller at Chronicle. In BEYOND THE RAILS, Kari examines the journey of two young runaways who leave their homes south of the border to sneak across into the US. However they pictured this land of plenty, however, the reality that awaits them is a lot harsher—and more dangerous—than they ever expected. Exploring the pertinent subject of young illegal immigrants, Kari Holt paints a vivid and unforgettable story. Look for BEYOND THE RAILS in 2016—it's one you won't want to miss! Tired of hearing all the good news coming in for Robin LaFevers' MORTAL HEART? No? Good, because there's a whole new list of praise for this book we want to share! First off, a starred review from Shelf Awareness! They love how "LaFevers blends history, intrigue and the forces of influence, while also putting a human face on the events". Then MORTAL HEART popped up as 6th on the Winter 2014–2015 Kids' Indie Next List. Move over Katniss Everdeen, the nuns of St. Mortain are the new girls on fire! There's more good news, if you can believe it... School Library Journal has a lovely interview with Robin and if you haven't seen it, you'll want to check it out. It's so insightful as to why Robin wrote this amazing series. Congratulations, Robin! The His Fair Assassin trilogy is going places! Have you seen it yet? If not, take a look--it's our favorite subversive Cat in a tutu! That's right, coming to a bookstore near you in May 2015, Cat will be donning on new holiday garb and impersonating--you guessed it!--the tooth-fairy! 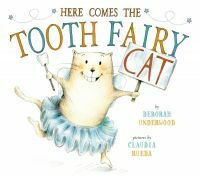 Watch for HERE COMES THE TOOTH-FAIRY CAT because none of us want to miss Deborah Underwood's artful texts or Claudia Rueda's glorious illustrations. Especially when Cat is concerned. Congratulations, Deborah! Melanie Crowder's PARCHED is now available in paperback! As of today, you can get your copy with a soft cover. Then you can see why this title is a Junior Library Guild selection, a Bank Street College Best Books of the Year, and received a starred review from the BCCB. Yeah, it's that good! Congratulations on the new release, Melanie! Bright, bold, and colorful, we love the new cover of Liz Garton Scanlon's IN THE CANYON! 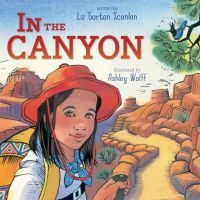 Illustrated by Ashley Wolff, the pictures compliment the text and transport us into the Grand Canyon with great detail. Each page has a treasure--petroglyphs, desert lizards, blue skies, and of course, sandstone cliffs. Watch for this one August 18th of next year! Congratulations, Liz! First Grade Dropout is a Class Act! 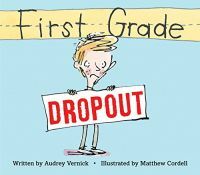 Audrey Vernick's next picture book, FIRST GRADE DROPOUT, has a new cover and it fits this funny tale perfectly! Illustrated by Matthew Cordell, our first grade narrator comes to life and helps us relive those embarrassing moments that sometimes aren't nearly as bad as they seem. Look for this one July 7th, 2015! Congratulations, Audrey! The Mark of a Good Book! The first review of Jennifer A. Nielsen's MARK OF THE THIEF is out and it's starred too! Kirkus Reviews says, "the fast-paced, ingenious plot, charismatic hero and highly diverse cast of characters—including the ancient, eternal city itself—make this series opener a captivating joy ride." Wow! This'll definitely be one to watch for when it releases February 24th, 2015! Congratulations, Jennifer! Elizabeth Shreeve Wants You to Meet CAPTAIN FREDDY! You know when you've got a winning character? When readers start to hear his voice in their heads, long after reading. And on that subject, I would like to introduce you to a very winning character indeed: young Freddy, star of the picture book CAPTAIN FREDDY COUNTS DOWN, is an energetic, enthusiastic, wildly imaginative little boy. You think he's getting ready for school (so does his mom). But really? He's off to inspect his rocket ship. This delightful picture book is brimming with fun and charm—and I'm delighted to say that it's now on its way to a bookshelf near you! CAPTAIN FREDDY COUNTS DOWN was acquired by the delightful Kelsey Skea at Two Lions, heading for a 2016 pub date. It's with great pleasure we roll out the newly-minted cover of Tamara Ellis Smith's ANOTHER KIND OF HURRICANE. This middle-grade novel is the story of a boy from Baton Rouge who loses his home in Hurricane Katrina and a boy in Vermont who loses his best friend in a tragic accident and how they come together to find healing. Newbery Honor Award winner and two-time National Book Award Finalist, Kathi Appelt says, "this poignant story barrels across the pages and into the reader's heart, reminding us that magic can arise from the deepest tragedy." This is one you'll definitely want to watch for in July 2015. Congratulations, Tamara! 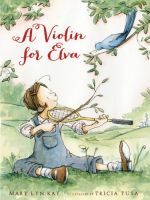 Today we're unveiling the adorable cover of Mary Lyn Ray's A VIOLIN FOR ELVA. Illustrated by Tricia Tusa, we think the art is charming and compliments the dreamer personality of Elva perfectly. What a great match of art and text! No wonder Booklist calls the book "an endearing tale of an ambition fulfilled" and Kirkus Reviews says "the language is simple and gorgeous." Congratulations, Mary Lyn! A Cinderella That's Out of This World! It's as good as the title sounds and now it's as good as it looks too! 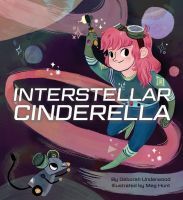 Check out the fun new cover of Deborah Underwood's INTERSTELLAR CINDERELLA. Illustrated by Meg Hunt, Cinderella never looked happier. And why wouldn't she? She's out fixing spaceships and riding rockets. Watch for this fun take on an out of this world fairy tale after May 5th of next year. Congratulations, Deborah! Released Today: Like Water on Stone! Join with us in welcoming to the world Dana Walrath's LIKE WATER ON STONE! Apropos for this important day of remembrance, Walrath's novel-in-verse tells of a family and civilization ravaged by war. Pick up your copy today to find out why this book has received high praise from many places, including two starred reviews. You'll be glad you did! Congratulations, Dana! The dragons are back! Book two of Joshua McCune's Talker 25 series, INVISIBLE MONSTERS, has a newly-minted cover. Isn't it great? We love the dark, woodsy textures in the background. Watch for this one on April 21st of next year. Congratulations, Josh! What's better than a Thursday before a holiday weekend? A Thursday before a holiday weekend with a cover reveal! 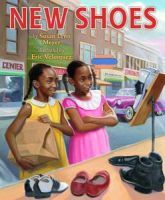 Congratulations to Susan Meyer on the beautiful, bright cover of NEW SHOES, illustrated by the talented Eric Velasquez. Look for this power picture book on January 1st! Yay, Susan! MORTAL HEART is Out and Available to Own! Robin LaFevers' MORTAL HEART received rave reviews, including three starred reviews. It's been on iTunes Best Books of November, November 2014 LibraryReads Top 10 list, and a few other lists we'll be sharing soon. And guess what? It's out and available to own! Pick up your copy today and find out why this last installment of the His Fair Assassin Trilogy is turning heads. Congratulations, Robin! May Annith find her way into the hearts of many readers! 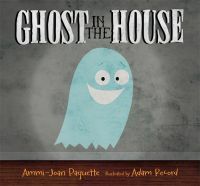 You may remember Ammi-Joan Paquette's GHOST IN THE HOUSE from last Halloween. This cumulative counting story really hit a nice nerve—celebrating scary things that go bump in the night in a way that appeals to the youngest readers. It had a lovely review in The New York Times, was called "peppy" and "evocative" by Publishers Weekly, and was deemed "bouncy" by SLJ, which said it would make "an enjoyable read-aloud for a not-so-scary storytime." In fact, it's sold so beautifully that Candlewick is releasing a lift-the-flap edition in summer 2015! It's a natural evolution from Halloween to Christmas, right? And so we're pleased to announce a deal with Kate Fletcher at Candlewick for ELF IN THE HOUSE—another cumulative counting story, this time with Christmas creatures and a Santa surprise. Bet you can't wait to see what twist the end of this one brings! New Home for Melanie Crowder's Next Novel! Melanie Crowder's debut novel, PARCHED, was released last year to much acclaim, including a Junior Library Guild Selection and a Bank Street College Best Books of the Year listing. Her next novel, a dynamic YA novel in verse about women's rights activist Clara Lemlich, will be released from Philomel Books in January 2015. Today, I'm thrilled to announce a new book on the docket for Melanie, reuniting her with her HMH editor, Reka Simonsen, in Reka's new position at Atheneum Books for Young Readers. Melanie's new novel, A NEARER MOON, returns her to the middle-grade arena, in a sweeping tale of a girl seeking a cure for her sister's mysterious illness, in a world where water sprites play havoc with the land around them, and magic lurks just out of sight. Look for A NEARER MOON in Fall 2015. Congrats, Melanie!